Congratulations to Cat who is the lucky winner of the giveaway! 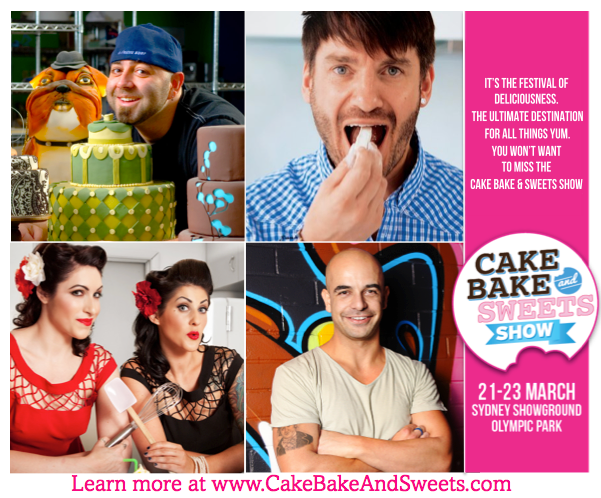 The biggest names in the world of baking and cake decorating are coming to Sydney in March for the ultimate foodies show! This one of a kind event is packed full of celebrity demos, competitions, classes and interactive workshops. You’ll learn new skills and techniques, get top tips and baking advice, shop for the latest supplies, and have book signings with the stars of baking and much more. We have 2 x Day Pass Tickets which will go to one lucky winner. Edit: Apologies, it is a day pass, not a two day pass. We will randomly choose the winners – one entry per person! Sunday 16th March @ 9pm. We require your details within 24 hours to allow postage time. – We will use a Random Number Generator to pick the winner. – This giveaway is sponsored by Cake Bake & Sweets who have provided the prizes. I absolutely love Black Forest Cake. The chocolate and cherries are a match made is heaven. I love Raspberry and White chocolate baked Cheesecake. The marriage of flavours and textures was made in heaven. My favourite desert is cheesecake and ice cream – home made…yummo! My favourite dessert is any kind of fruit pie. Loving apple pies at the moment. My favourite dessert is my sticky date pudding which has a delicious moist and gooey taste and is perfect with a scoop of ice cream and a butterscotch sauce.